Should You Choose Triple Glazing? It’s often at this time of year (when windows are kept shut and the cold weather hits) that homeowners start to think about whether their glazing is adequate for their property. A question we often get asked here at Merton Windows is whether triple glazing is worth it and what the benefits are. While double glazing is the most suitable choice for many homes, triple glazing is a viable alternative if double glazing doesn’t meet all the functionality requirements you need. Here’s our guide to triple glazing and who should consider having it installed. As the name suggests, triple glazing consists of three panes of glass (compared with two in double glazed windows), all separated by the presence of argon gas. Argon gas is used in windows as an insulator because it’s a poor conductor of heat, making it more difficult for warmth to escape from your home. For this reason, triple glazed windows often have a lower u-value than double glazed products. The extra sheet of glass can also reduce the solar performance of a window, lowering how much of the sun’s energy can enter your property. This is great news for those whose rooms are too hot, but many find high quality double glazing is all they need to eliminate draughts, keep their homes warmer and decrease condensation. When Should You Choose Triple Glazing? Triple glazing is most commonly selected for its noise reduction benefits. Many homeowners struggle to sleep if there are frequent sounds outside, or they want to block out some of the noise produced by overhead flights or traffic on a busy road. The additional pane of glass between the inner and outer sheets provides a buffer while the argon gas absorbs the sound vibrations that attempt to enter your rooms. Those looking for a more peaceful home or a quieter working environment find triple glazing the ideal solution for their needs. 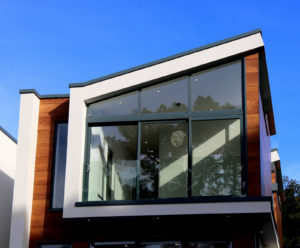 As well as temperature control and noise, there are a few other factors to consider when deciding if triple glazing is the right option for your requirements. The extra sheet of glass can make your windows heavier, so high quality frames are a must. You should also consider how you open your windows. If you’re looking to replace period property windows but find double glazed sash windows difficult to open, for example, a heavier product may not be the ideal choice. Triple glazing is usually more expensive than double glazed windows, but some would argue that lower energy bills could offset the cost over time. Whatever the type of glazing you think is right for you, here at Merton Windows, we have a wide range of energy efficient windows for you to choose from. Working across Surrey and London areas (including Clapham, Mitcham and Raynes Park), our team takes the time to discuss your individual requirements, finding solutions for any existing issues you have. To book a free, no obligation consultation and quotation, simply call now on 020 8542 2233.